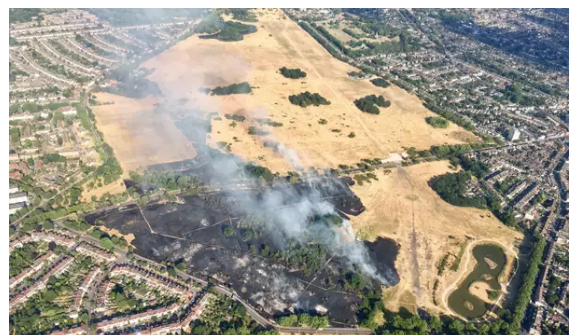 Wanstead Flats fire, 15 July 2018. Photo Evening Standard/NPAS. This last year has been more dominated by external events than work within the Park (though that has been continuing, with improvements to the Long Walk and Perch Pond). In the Summer the fires on Wanstead Flats received national press coverage and the devastation to vegetation and wildlife habitat was substantial. As ever, the local community rallied around to clear the rubbish left exposed by the fires. In the Autumn the local community got wind of the City of London’s plan to consider accommodating a major music festival on Wanstead Flats. Emotions ran very high for several months and the Friends of Wanstead Park produced a statement setting out our support for major events on the Flats such as the Fairs and the Fireworks display but that we felt the information was too incomplete to support such an event at that stage. A further proposal has since been made on which consultations are currently in progress. Finally, we also got informed by the City of London that the Environment Agency had decided to assess three lakes in the Park as high risk water bodies. These are the Heronry Pond, the Perch Pond and the Ornamental Waters. The lakes are considered high risk in the event of a massive rain event which will fill the lake so rapidly that a torrent overtops the dam and quickly erodes the back wall of the dam causing the lake to fail. The result could be that the massive swell of flood water flows into the next lake doing the same. If all three lakes fail it will create a cascade-effect flooding properties in Ilford. Engineers have been employed to estimate the works and initial ball park figures are between £5 and £10 million. Inevitably this will lead to huge disruption in the park over possibly three years. However, there may be a silver lining. The City has indicated it would make sense to carry out other non-statutory works at the same time, such as lining the lakes to make them waterproof. The significance of the non-statutory funding is it can be used to provide the 10-20% match-funding required for a Heritage Lottery application. For the past 10 years the Friends of Wanstead Park have been working with the City of London developing the Parkland Plan to guide a Heritage Lottery Application. For the last three years we have expected the City of London to apply for the funding, but it held back as information gaps remained, not least on costings. Last year the application was delayed so the City could develop a twin-track plan developing the restoration of the three lakes and the regeneration of Wanstead Park. We now hope the City can manage what will potentially be a £15 million Lakes and Parkland restoration! Other projects which have been ongoing is the Friends pivotal role in attracting the Fields Study Council (FSC) project to be based in Wanstead Park, working with children and other groups. The Friends managed an impressive number of events every month at the Temple, over the last year, despite the extended closure period January-November. These included the RSPB Bird Watch Nature Club, the Temple 'Turf Wars' by Peter Williams and Mark Gorman, Spring Nature Club, Concert in the Enclosure, two FSC workshops with children, author, Geraldine Robert’s talk, WW1 Commemoration activity, Christmas Crafts. Also, the Friends had stalls at several local events during the year, notably one at September’s Wanstead Festival and were instrumental in organising two profitable Quiz Nights. Funds remain healthy, with an increase of about £1,500 on the previous year. We don’t intend to just sit on this money – we are actively looking for new small projects to support in line with our mission to improve visitors’ experience of the park and raise awareness of its history and ecology. Finally, the Friends are now represented on the new Epping Forest Consultative Committee representing the whole range of Forest users and we continue to press the London Borough of Redbridge and the City of London to begin planning the play area beside the Temple as promised at the Wanstead Park Summit in 2017.